The people and place names mentioned in John’s record (1904-1911) at Los Algarrobos and Cruz Grande, as well as the writings of others associated with Los Algarrobos, form a unique set. We will be adding information, names, and maps as we add more material, e.g. the recollections of others. Any improvements and corrections are welcomed. A brief History of Monte Buey, translated into English from the Monte Buey website. An itenary of John and Marjory’s Trip to England in 1910, includes names of people met and places visited. See: Robert A. Warner’s map of 1895/8. The estancia is located 10km. south-west of present day Monte Buey, in the south-eastern corner of Córdoba province (see maps). 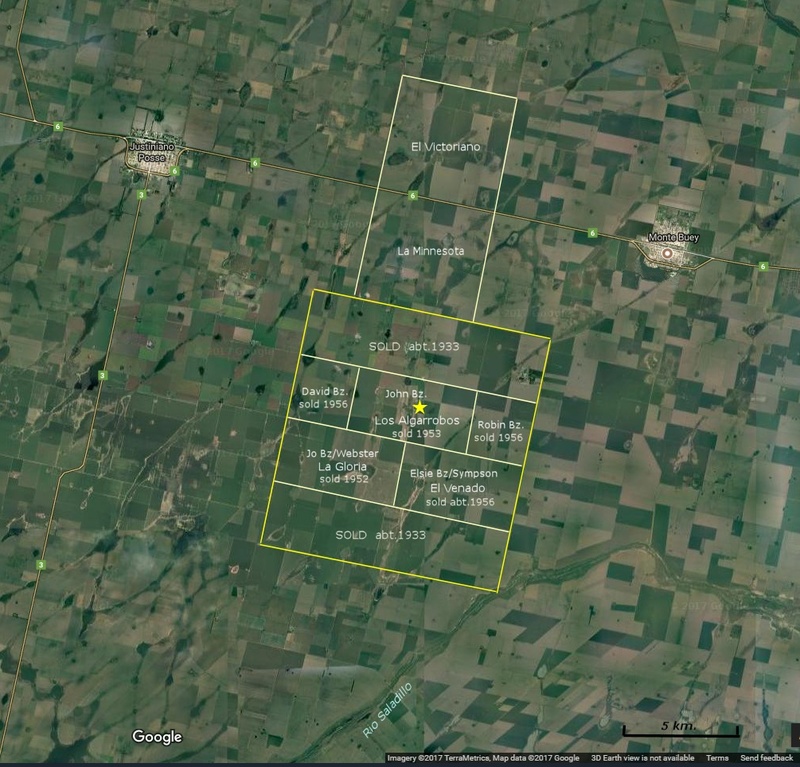 On early property maps, it comprised the entire “suerte G 61”, the south-east corner of which touches the Rio Saladillo. Its first owners, the Barclay family (brothers Richard & Henry, sisters Millicent & Georgina), bought it from the provincial government in 1864. They protected their house against indian attacks with a moat — three indians died in attacks and are buried at the estancia. The moat can still be seen, as well some of the original monte (woods) of the native tree that gave the estancia its name: Los Algarrobos. The houses were razed in the late 1920’s. In June of 1896, John E. Benitz (with Benitz Hermanos funds) bought it from the Barclays — 3¾ old sq. leagues, (10,125 has., 4.05 metric sq. leagues). John fenced the land, installed windmills (ensuring water), sowed alfalfa and crops, and enlarged the casco (headquarters), built a much larger house as well as a large barn, several sheds, and housing for staff and employees. Livestock on March 30, 1910, consisted of: 6,903 head of cattle (short-horn), 518 work horses & mules, 618 brood mares & colts, 3,483 sheep, 309 pigs. He also managed and/or held shares in neighboring properties, in particular locally to the immediate north: “La Minnesota” and “El Victoriano”. Unfortunately, in 1916 John died in a flash flood at his summer home in Cruz Grande (Cba) and management of “Los Algarrobos” fell to his brother-in-law, Robert P. Mackintosh. In about 1928 its management was handed to John Benitz (John E. Benitz’s eldest son). In the early 1930’s half the land was sold to meet debts; the remainder was divided equally between John E. Benitz’s four surviving children (a half-league each: 1,250 has. ): Elsie (& Tommy Sympson) El Venado, Jo (& Howard Webster) La Gloria, John’s & Alfred’s shares were combined and included the original Los Algarrobos casco. Alfred having died in 1933, John managed the combined unit (see map of it’s fields above) until 1953 when it was sold and he retired to England. Very flat with lighter soils than those of La California, Los Algarrobos was originally used for sheep and cattle breeding. Today it is dedicated to crops (in particular soy beans for which its soils are excellent) and cattle fattening (grass fed). People are listed by their surnames then their first-name (if both known), followed by their titles (Cacique, Capt., Comandante, Don, Mr., Sr.). People may be listed twice for the diary entries don't always provide full names, in particular of those people the writers are familiar with, especially the workmen. Therefore, when searching for a person, search separately for both the person’s first-name and surname. Note: We have omitted the possesive “S” that John often added to names without the required apostrophe. 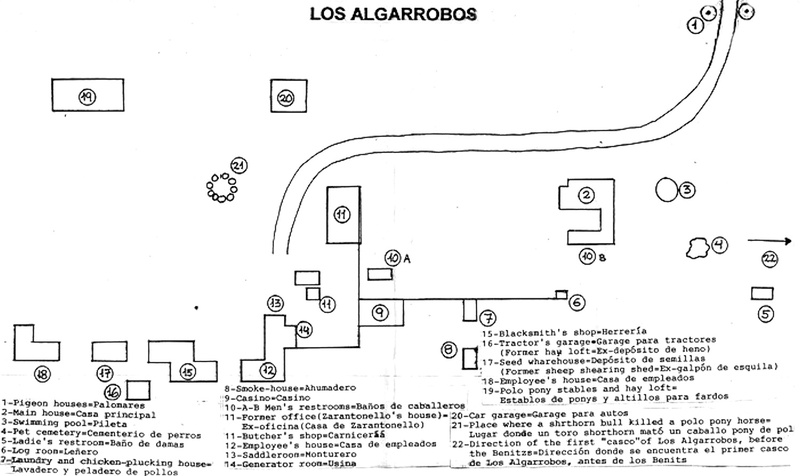 Places are listed by their proper name, followed by any preposition (El, La, Los, The) or feature qualifier unless that feature is specifically part of the name such as with the town of “Cañada de Gómez”: arroyo(creek), cañada(low-land), colonia(colony), estero(marsh), fuerte(fort), isleta(island), laguna(lake/lagoon), mar(sea), paso(crossing, ford), rio(river). Ñ - we treat as an accented N, not as a separate letter (as it is in the Spanish alphabet). The tilde was usually omitted by English writers, as were most accent marks on vowels. (1904 Feb) - Many entries are followed by one or more dates in brackets. These dates indicate the first month in which a name is found in John E. Benitz’s diary of the year shown. Alfred – Alfred A. Bz. – 2nd gen.
Herman – Herman Bz – 2nd gen.
Johnnie – John E. Bz. – 2nd gen.
Josephine – Josephine Bz-Schrieber – 2nd gen. Mother - Josephine Kolmer-Bz - 1st gen.
W&J – William & Josephine Bz – 1st gen.
WBz – Wilhelm Bz – 1st gen.
Willie – William O. Bz. – 2nd gen.
For more about the Benitz 2nd generation, see this family page. (1908 May) Re sale of El Victoriano. (1911 Dec) Returns from England. Son or brother of T.F. Agar, he married Bernice Avery at “La California”; she was a fellow school-teacher of Clara E. Allyn, wife of WOBz (Willie). (1907 Mar) Met by JEBz on arrival in BA; he later visited Los Algarrobos & La California. (1909 Dec) JEBz settled accounts. Mr. & Mrs R. Agar visited. (1910 Mar) Sailed for England. JEBz business partner in “Scottish Estancia Co. Ltd” & “The Bermejo Estancia Co. Ltd.” He was also a partner in the farm supply company: Agar, Cross, & Co..
(1904 Feb) JEBz met in BA, with his family. (1909 May) JEBz requests he sign up Marjorie Daw for school. (1909 Dec) JEBz settled accounts. (1910 Apr) JEBz had power of attorney certified. (1910 Jul-Oct) Partners meet in England to form the The Bermejo Estancia Co. Ltd. - see diary: 7 July, 28 Sept., 6 & 12 Oct.
(1911 Oct) Sails for Arg. (1912 Dec) Sails for England. Respected agricultural implement supply company in Argentina. Founded in 1884 by T.F. Agar, Malcolm Cross, and others. The company distributed many leading brands, the best known is the “Aermotor” windmill; made in Chicago, Agar Cross sold over a millon of them in Argentina, many are still running on estancias today (2010). Reorganised in 1967 as a supplier of agricultural chemicals and fertilizers. (1904 May), (1909 Dec), (1911 Mar) Mentioned. (1910 Dec) To Cruz Grande, for New Year. Per context, either John’s (JEBz) brother: Benitz, Alfred A. (AABz), or son: Benitz, Alfred Donald, “little Alfred” or Alfredito (ADBz). Alfred Alexander Benitz (1859-1937) – see his short bio. & much more; 8th child of Wilhelm & Josephine Benitz. Estancia bought by JEBz from the Barclay family in June, 1896 (3¾ old sq. leagues, 10,125 has. ); located south of Monte Buey in south-eastern Córdoba province. See title section above for more. Approx. : Los Algarrobos Livestock Company, Inc., company set up by JEBz on March 16, 1906, to own Los Algarrobos. Final papers were drawn up May 17, 1906, with JEBz as the major shareholder, with several minor partners included to meet legal requirements (see diary, Jan. 1907 for details). The draft of his first annual report can be found at the foot of the 1907 diary. Clara Elect Allyn (1858-1930) – see her bio. pages; wife of William O. Benitz. (1907 Aug) Short-horn judge (Sociedad Rural Santafecina, Rosario) with JEBz. (1910 Apr) JEBz met him in Reconquista. Servant taken to Cruz Grande. (1911 Mar) Mortgage on Los Algarrobos. Town on RR 25km. west of Cañada de Gómez (& 35km. south of La California). (1906 Mar 19) Signatory (& shareholder) of Los Algarrobos Sociedad Anónima Ganadera. (1906 May) Mentioned in lawsuit. (1910 Oct) Joined JEBz family on return from England, segundo at La Minnesota. Abbreviation universally applied to Buenos Aires within the Anglo-Argentine community. (1907 Jul) With JEBz, Jo, & Elsie, visited Los Palmares; ending her tenure as governess, she went to Concordia in north-east Entre Rios prov. (1909 Jan) With JEBz family to Cruz Grande. Jun'09: To England with the family, on holiday. (1910 Jan) To Cruz Grande. (1910 Nov) Directors meeting in Bell Ville, JEBz president. British Bank of South America: 1862 began as the “Brazilian and Portuguese Bank”; 1866 renamed “English Bank of Rio de Janeiro”; 1891 renamed: “British Bank of South America” operating in Brazil & Argentina; 1920 taken over by “Anglo-South American Bank”; 1936 liquidated. (1910 May) JEBz meets with H. Miller & E. Carlemagno re founding branch. Argentine national bank, with branches in most large towns. Most provinces have their own provincial banks as well. The Bank of London and South America (BOLSA) was one of the few banks to survive the crash in the 1930’s; it was considered very solid. It was formed in 1923 when Lloyds Bank combined its subsidiaries: the London and Brazilian Bank (founded 1862) and the London and River Plate Bank (founded 1862). In 1986, BOLSA was merged into Lloyds Bank. (1910 May) Involved with purchase of El Bermejo & mortgage of Los Algarrobos, see diary. Shire stallion from England, see Birmingham. (1907 Jun), (1908 May), (1909 Nov) Mentioned. Estancia west of Los Algarrobos., possibly 25km. SW.
(1910 Jun) JEBz sent sheep. Malaya? Near Lezama (100km. SSE of BA), see owner: Manuel José Cobo. (1907 May) JEBz visited to buy bulls. Large town in south-eastern Córdoba province and a stop on the Ferrocarril Central Argentino between Rosario and the city of Córdoba. Monte Buey and Los Algarrobos are about 50 km. to its SE. Originally known as Fraile Muerto (Dead Friar), in c.1870 it was renamed Bell Ville in honor of Robert A. Bell, from Dunbar, Scotland. He and his brother, Anthony M. Bell, were amongst the first estancieros to settle the area in the 1860’s, and were leaders in the campaign to rid the area of malones (indian raiding parties — see Spanglish Glossary). See Show and Exposición Rural in our Spanglish Glossary of camp terminology. (1908 Apr) JEBz poder general to manage AABz’ land in Cruz Grande (El Rincon); 10 May'08 AABz sailed for US & Canada (Yukon), arrived back 15 Nov'08. (1909 Nov) Buys the TL. (1910 Jan) visits Los Palmares; Jan & May'10: loans to JEBz; Jun'10 trip to England, & Africa. “little Alfred” or “Alfredito” - John (JEBz) & Marjorie’s 5th child: b: 1903, Crúz Grande; m: 1927 ‘Nancy’ Jeffries; d: 1933, Crúz Grande. (1911 May) Enrolled at St George’s College. Clara Electa Allyn (1858-1930) – see her bio. pages; wife of William O. Benitz. John (JEBz) & Marjorie’s first child. b: 1893, La California ? ; m: 1917 T.M. (Tommy) Sympson, d: 1965, Nono, Córdoba, Arg. She & Tommy lived at “El Venado”, her share of “Los Algarrobos”, inherited from JEBz. (1907 Jul) Visited Los Palmares. (1908 Jul) Taken to England, to school with sister Jo, at St Katherine’s Lodge, St Andrews, Fife, Scotland. John (JEBz) & Marjorie’s 2nd child. b: 1895, La California ? ; m: 1922 J. Howard Webster, d:1987, Wales, UK. She & Howard lived at “La Gloria”, her share of “Los Algarrobos”, inherited from JEBz. (1908 Jul) Taken to England, to school with sister Elsie, at St Katherine’s Lodge, St Andrews, Fife, Scotland. “little John” - the 4th child of John (JEBz) & Marjorie. b: 1901, Crúz Grande; m: 1926 Aphra A. Peard, d: 1975, Herriard, Hampshire, England. John Edward Benitz (1861-1916) – see a short bio. & much more. ; 9th child of Wilhelm & Josephine Benitz. Owned, partnered in, or rented several properties: Los Algarrobos, El Victoriano, El Bermejo, La Minnesota, Crúz Grande. b: 1861, Fort Ross, California; m: 1892, Marjorie M. Macintosh; d: 1916, Crúz Grande (Cba). (1907 Jan) The controlling shareholder in Los Algarrobos Sociedad Anónima Ganadera. Mrs. Josephine Benitz (1830-1912) – see her bio. pages; wife of Wilhelm Benitz. (1910 Jan) Moved into new home, La Josefina; celebrated 80th birthday, 6 Jan'10; support checks from WOBz & AABz; Feb'10: Dr. Lloyd attended her for rheumatism; May'10: JEBz sends her 8 pigs. Marjorie Morris Macintosh (1858-1945) – see her bio. pages; wife of John E. Benitz. (1908 Jul-Dec) Took all 3 daughters to England, Elsie & Jo remained in Scotland at school. Third child of (JEBz) John & Marjorie. b: 1897, Rosario, Santa Fé, Arg. ; d: 1916, Crúz Grande (Cba). (1909 May) JEBz wrote T. Agar to sign her up for St.Katherine’s - joining her sisters. William Benitz (1815-1876) - see his bio. pages – family patriarch; married Josephine Kolmer, 1846. William Agar Benitz (1888-1956) – see his bio. pages; son of William & Clara Benitz. (1911 Mar) JEBz visited WABz at La California. William Otto Benitz (1854-1911) – see his bio. pages; he married Clara E. Allyn, & was the 6th child of Wilhelm & Josephine Benitz. (1909 May 12) Travels by motor car from La California to Los Algarrobos (5hrs), first time. (1909 Dec) JEBz protests interest & pastaje charged by WOBz. (1911 Apr 1) Dies in Corsicana, Texas. Present were: Clara, brother Alfred, daughters: Nena, Bernice, & Marion. (1908 Nov) JEBz attended sale. Large tributary of the Paraná river in northern Argentina, drains from NW to SE separating the provinces of Formosa (to its north) and Chaco (to its south). Estancia (25,000 ha.) located in Chaco province (a national territory in the 1900’s). Shaped in the form of an inverted "T", the vertical leg (5 km wide along the Rio Bermejo) went south 10km to join a 10 x 20 km. east-west cross-piece. The town of Zapallar (today: Gral. J. de San Martin) was next to the SW corner of the cross-piece. Used for breeding beef cattle; managed by JEBz but owned by The Bermejo Estancia Co. Ltd..
(1910 Apr) Originally known as Campo de Araoz, owned by Dr. Blanch in BA. Offered to JEBz by agent Nicolas Siffredi. JEBz inspected it & then bought it for T. Agar et al at $14/ha. Many names involved (see diary 15 Apr'10 — 15 May'10, & notes July'11). JEBz also offered $18/ha. for another 5,000 ha. of Dr. Blanch’s, and $20/ha. for Campo Winter (10,000 ha.) - both offers contingent on T. Agar’s acceptance (denied). (1917) Hints that it was sold. A partnership between Thomas F. Agar (chairman), Malcolm Cross (director), Col. J.S. Ruston (director), JEBz (manager in Arg. ), and others (minor shareholders: Clara Agar, Muriel Amy Ruston, Marjorie Benitz, James Orr, H.M. Brodie, T.H. Wrensted) for the purchase and management of estancia El Bermejo (see its entry). (1910 Jul-Oct) Partners meet in England to form the company - see diary: 7 July, 28 Sept., 6 & 12 Oct., 1910. (late 1950’s) JEBz’s grandchildren sell their shares in the company. Secretary of the provincial Comisión de Caminos, in Córdoba city. (1908 Mar) JEBz met with often, through 1911. (1905 June) Mentioned re stallion. (1910 Aug) JEBz & family visit in Clovelly, Devon, England. (1909 Jan) Visited Cruz Grande. (1910 Jun) Trip to England, with JEBz et al. Lived in BA, sold Campo de Araoz / El Bermejo to JEBz (acting for the Agars). (1910 May) JEBz meets, agrees to sale. (1908 Jul) Mentioned. Possibly Palos Blanco - way south of Los Algarrobos? In 1874, the Bohtlingk family (from Germany) arrived in Argentina with the Benitz and Schiele families, on the ship S.S. Boyne. They owned estancias Las Chilcas and Santa Clara, bordering La California to the NW & east respectively. (1911 Mar) JEBz visited him at Santa Clara. (1905 July) 3 towns visited by JEBz 150+km west of BA. (1909 Dec) A Swede, became assistant book-keeper at Los Algarrobos - $50/mo. (1907 Dec) Horse trading w/Mr. Paul. (1905 Oct) Mentioned re sale of Monterey. Province that surrounds BA (city), it is the largest province and encompases most of the pampa humeda. Its capital is La Plata, on the coast 60km SE of BA. aka: Palermo Show - an anual event lasting 1-2 weeks in winter. (1910 May) Brought mares to be served. (1908 Jul) Mentioned, see La Quebrada. (1904 May) Capataz at El Victoriano. (1906 Nov) Witness for JEBz in suit. (1909 Jun) JEBz bought Chacra Lujano from her. John E. Bz managed it 1884-1899. City just north of BA, on RR to Rosario. (1905 Mar) Mentioned - estanciero from San Marcos. (1910 Apr) Offered to JEBz by agent Nicolas Manfredi: 20,000 has. JEBz offers $14/ha. (1910 May) Owner in BA, Dr. Blanch, agrees to sale. 4 sq.leagues (10,000 ha.) given to General Lorenzo Vintter (1842-1915) for services rendered, principally in campaigns against the indians (see Wikipedia). John (JEBz) wanted the The Bermejo Estancia Co. Ltd. to buy it; however, Alfred (AABz) bought it in 1917 from Vintter’s daughters. He later added another 8,000 hectareas. All of it was sold after his death, 1937. 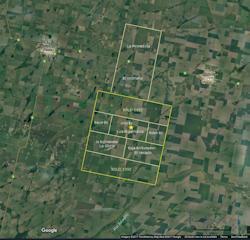 Located north-east of the town of Gral. J. de San Martin (Chaco) on the southern shores of the Rio Bermejo, between the river (north) and the estancia El Bermejo (south & east). Large town in central Santa Fé province and a stop on the Ferrocarril Central Argentino between Rosario and the city of Córdoba. Las Rosas is about 40 km. to its north, La California about 30 km. Town 60km. south of Los Algarrobos, between Rio Cuarto (Cba) & Venado Tuerto (SFé). (1910 Dec) To Cruz Grande, for New Year..
(1911 Jul) Sent to El Bermejo to prep for JEBz. (1904 Sept.) Sold rams to JEBz. (1905 Mar.) Commission agent? Mentioned. (1908 Sep) Judged cattle with JEBz at show in Bell Ville. Treasurer of Comisión de Caminos de Union. (1910 May) Meets with JEBz re founding Banco de Córdoba, Bell Ville. (1908 May) Mentioned re Sec. Beyados. See Comisión de Caminos. (1910 Mar) Bought wheat from Los Algarrobos & La Margarita. Town 70km. SW of Los Algarrobos, half way between Rio Cuarto (town) & Venado Tuerto (SFé), on the Rio Cuarto (river) before it becomes the Rio Saladillo. See maps. (1907 Aug) Estancia (owner: Eduardo Regunaga, 1905), 10km. south of Bell Ville, mentioned. (1904 May) Escribano publico [notary public] in Bell Ville. In the diaries, the name most often refers to the Gran Chaco climatic - geographic region (hot semi-arid lowlands) that in Argentina includes the northern 1/3 of Santa Fé province, north-eastern Santiago del Estero province, all Chaco and Formosa provinces. See Wikipedia for more details. Neighboring province to the north of Santa Fé (prov.). In 1910 it was a national territory, made a province in 1951. Its capital and largest city is Resistencia. Farm belonging to Manuela Zapata de Calanilla in the Cruz Grande valley. (1909 June 2) JEBz bought 8 has., $1,800. (1907 Sep) Imported sow, died. See Benitz, Clara E. Allyn de (wife of WOBz). (1905) Town 60km. NNW of Rosario, 30km east of Las Rosas. (1907 May) JEBz bought bulls. (1908 Sep) JEBz bought 15 bulls, $600 each. Roads Commission, by provincial department (county). In 1908, JEBz was on the Comisión de Caminos de Punilla and Unión. Appointed president of both. See: Beyados (Provincial Secretary), Francisco Carlemagno (treasurer), Francisco Tase. (1908 Oct) See activity leading up to this date. (1909, 1910) JEBz meets continually with provincial officials in Córdoba city: governor, ministers, etc. Córdoba is a large city in the eastern foothills of the Sierras Chicas in the very center of Argentina, about 700km NW of BA. Capital of the province by the same name, founded in 1573 it is one the first Spanish colonial cities of the region (today Argentina, Paraguay, & Uruguay) with the region’s first university (1613). Today it is an important industrial manufacturing center. JEBz travels often to/from Córdoba (via train from Bell Ville), 250km. NW of Los Algarrobos. Named after its capital city, it’s western half is dry and mountainous, the east half flat. The SE quarter lies within the pampa humeda – the agriculturally rich humid pampas (the area in which Los Algarrobos is found). Santa Fé borders it to the east, BA prov. to the SE. See Sierras Chicas & Grandes de Córdoba. (1910 Oct) Joined JEBz family on return from England. (1911 May) Lent JEBz an arab stallion. JEBz business partner in “Scottish Estancia Co. Ltd”, “The Bermejo Estancia Co. Ltd.”, & estancia “Monterey”. He was also a partner with T.F. Agar in the farm supply company: Agar, Cross, & Co..
(1905 Jan.) JEBz met in BA. (1907 Jun) Final close of Monterey. (Small Cross) Village in The Hills (of Córdoba) between Cruz Grande and La Cumbre. (Large Cross) River & village 7km. north of La Cumbre (Cba) where the Benitz family established most of their summer homes (see The Hills). JEBz’s summer home took the same name; built in 1904, the property later became part of St. Paul’s School. Name mentioned often, as the town, river, or JEBz’s home. JEBz bought various bits of land in the Cruz Grande valley for himself, AABz (El Rincon), and sister Josephine (Los Nogales); the land was all bought from various members of the Zapata family - see their entries. The principal town of the Anglo-Argentine community’s favored summer resort area on the west slopes of the Sierras Chicas de Córdoba. See The Hills. (1910 Jan) Visitor at Cruz Grande. (1906 Jun) Mentioned as nurse. (1905) Town 70km. NNW of Rosario, 50km ENE of Las Rosas. (1911 May) Hired, at $100/month. Estancia owned by Benito Villanueva near Vedia, town between Junín and Rufino in NW Bs.As. province (about 250km. SE of Los Algarrobos). (1909 Nov) JEBz attended remate, bought bulls. (1911 Oct) H. Storey bought bulls. (1911 Mar) JEBz met in BA re The Bermejo Estancia Co. Ltd. Alternative name for the Short-horn breed of cattle (red with variegated white markings). Developed in the US during the mid to late 1800’s as a more productive beef animal than the Texas Long-horn. It was imported into the Argentine, but lost favor to the beefier British breeds Hereford (red with white faces) and Aberdeen-Angus (all black). For more detail, see vacunos (cattle) in our Spanglish Glossary. Daughters Josephine Bz de Schreiber, nieces of JEBz. Piece of land bought from Benjamín Sastre by JEBz on 17 May, 1904, for the Scottish Estancia Co. Ltd., it comprised 939.917 ha. (at $40 per ha., $37.596.68, or 439,881.16 USD-2000); located west of La Minnesota & south of El Victoriano (to which it was added). JEBz estimated its true size to be 961 ha. For full details, see his diary, 17 & 30 May, 1904. Estancia near La Carlota (Cba). (1907 Mar) JEBz attended its sale. Ferrocarril Central Argentino - see below. Ferrocarril Oeste - see below. JEBz (diary, 21 April, 1908) mentions a crew surveying for a proposed line north of Los Algarrobos. However, it seems more likely to have been the F.C.C y R. or the F.C.O.S. (Ferrocarril Oeste Santafecino, bought by the F.C.C.A. in 1900). The line passed between La Minnesota (south) & El Victoriano (north). Ferrocarril Córdoba y Rosario - see below. (1909 May) Arrived, to go to La Minnesota. (1910 Jun) Sent to fetch potros at estancia San Sebastian. Nephew of the Agars, sickly. (1909 May) Arrived with mother, to learn camp work. (1910 Jan) Visitor at Cruz Grande. ; returned to La Minnesota. JEBz often rode this railroad. Wide gauge railroad built 1863 - 1870 by William Wheelwright (North-American with British capital), it joined Rosario with Córdoba city, passing through Cañada de Gómez, Bell Ville, and Villa Maria. In 1908 it absorbed the BA to Rosario line, nationalized in 1949, it became part of the Ferrocarril Nacional General Bartolomé Mitre (F.C.N.G.B.M. ), privatised during the 1990’s, it is today part of the Nuevo Central Argentino S.A. (N.C.A.). Click here for a history of Rosario railroads and the N.C.A. The first railroad of Arg., begun in 1857. Centered on BA, it spread west as its name indicates. It did not have lines in Córdoba or Santa Fé. Metric gauge railroad that ran between Rosario and Córdoba paralleling the F.C.C.A. to the south, passing through Casilda, Cruz Alta, Monte Buey (in 1910), and Río Tercero. Begun after 1888, may have changed its name to the Ferrocarril Central Córdoba (F.C.C.C. ), it apparently was acquired by the F.C.C.A. prior to 1910 because the track through Monte Buey was laid by the F.C.C.A. Town in south Santa Fé, half way between Venado Tuerto & Rosario. (1905 Mar) Mentioned, manager at Monterey. (1906 May) Plaintiff in lawsuit vs Austin. (1907 Jun) Mentioned re settlement of Monterey by Cross. (1911 Nov) JEBz offered steers. Inspector from Banco Hipotecario Nacional. (1911 May) Visited Los Algarrobos. (1911 Jun) Mentioned re Los Algarrobos mortgage. (1910 Feb) JEBz sent him 2 horses, orig. from Monterey. (1911 Oct) Mentioned in Woodgate. Misspelling? (1909 Mar) Mentioned, re Cruz Chica. (1907 & 1908) See Urdaniz. (1910 Mar) Land owner, see Mr. Potter. Estancia part of Los Algarrobos. JEBz’s daughter Jo and her husband Howard Webster inherited it when the Algarrobos was split up, c.1930. Jo sold it in the early 1950’s when she retired to Chañar Yacu, in Nono, Sierras Grandes (Cba). JEBz also spells it Mercedes Gonsalez de Zapata - see Zapata. (1905 Mar.) Mentioned - in BA. (1906 May) Lawyer. Mentioned in lawsuit, Francis vs. Austin. The summer home of WOBz, it was on the road to Los Cocos from Cruz Grande, a 2-3 kilometers north of his siblings. (see The Hills). (1910 Jan) Mr. & Mrs. R. Agar visited. (1910 Mar) Visited with Mr. Neild. Owner of a narrow-gauge RR going 50-100km. west out of Las Palmas (Chaco prov. ), likely used to haul lumber. WOBz’s eldest child, JEBz’s niece. (1906 Jan) She married C.A.M. “Al” Watt, in Rosario. Al was born (1874) at Las Tres Lagunas when it was owned or rented (most likely) by his father. Mechanic at Los Algarrobos. See “Motor Cars”. (1909 Jun) Sent to BA with car wrecked by chauffeur. Nov'09: Drinks, overturns car. (1908 May) Commissioned to register JEBz’s stallions. Husband of Bertha J. Schreiber, JEBz’s niece. (1910 Jan) Mr & Mrs., visitors at Cruz Grande. Later visits Los Palmares. Live in Tucuman. Mrs. Hill is Margarita Thome, inherited La Margarita from father. (1910 May) Visit with child; review La Margarita. (1908 Aug) Mentioned, employed by JEBz per context. (1908 Sep) Bull bought from Martinez de Hoz, $4,400. (1909 Nov) Sent by Mr Pinnell to fetch a colt to race. (1906 Sep) Arrived from AABz. Name given to the westernmost league of La California, beyond Las Tijeras, it was sold in 1881 to pay off the debts of FJBz. Town 30km. SE of Los Algarrobos, 15km east of Monte Maíz. (1911 Aug) Taken to Los Algarrobos. Per context, either John E. Benitz or his son John Benitz “little John”. John Edward Benitz – see a short biography & much more. Josephine Kolmer (de) Benitz’s (JKBz - mother) home in Cruz Grande, Córdoba, built for her by son JEBz in 1910; across the Cruz Grande river south of JEBz’s summer home. His sons sold it (more than once) to AABz, their uncle. It was owned by AABz when he died in 1937; it was sold to the Bell family who renamed it Bellmont, subsequently it became part of St. Paul’s School. (1910 Jan) JEBz added land above it on the Cruz Chica river. (1905 April) Mentioned, peón at Los Algarrobos. Founded estancia Las Rosas (1864) and the town of Las Rosas (1889). Returned to England .... For more, see the maps on the pages for WBz’s estancia “La California” (founded 1875). In charge of Mr. C. Harley’s RR at Punta de los Rieles. Estancia approx. 10km. west of Canals (60km. south of Los Algarrobos). (1908 Nov) JEBz attended cattle sale. (1907 May) Livestock auction, Bell Ville. (1906 May) Mentioned in lawsuit, Francis vs. Austin. (1910 Jun) Trip to England, on ship with JEBz et al. (1906 Aug) Short-horn judge with JEBz. (1907 Mar) LEBz attended remate at his estancia, near Isla Verde. (1908 Aug) Arrived, will go to La Minnesota. (1909 Feb) “moved for good” to La Minnesota. Town on the RR 40km. east of Bell Ville (40km. north of Los Algarrobos). Estancia near Classon (SFé), owned by Seeman. (1910 Apr) Sold vaccine to JEBz. (1910 Feb) Attended JKBz for rheumatism, at La Josefina. Assistant book-keeper at Los Algarrobos. Estancia to east of estancia Las Rosas, established in 1874 by the Dickinson brothers, Henry and Alfred. They were first cousins of Olga. B. Horner, AABz’s wife. Town established by the Dickinson brothers in 1888 east of Las Rosas. It was absorbed by and became the major part of Las Rosas (which had the advanage of being on the railroad). (1909 Dec) Bought a Shire stallion from JEBz. Cattle buyer for “Frigorifico River Plate” / River Plate Fresh Meat Co.
(1906 Nov) Visited, trip to UK. (1909 Apr) Visited, travelled with the family to England. (1906 Jun) Mentioned, living in Firmat. In Aug'06, FEBz backed his loan, again Sep'06. (1907 Jan) Shareholder in Los Algarrobos Sociedad Anónima Ganadera. (1911 Feb) Mentioned re loans. (1911 Aug) JEBz visited in BA - friends? “an old Chaco man” — most likely dating from “Colonia California” (see Frank X. Benitz’s pages) and “Colonia Espín” (see Frank J. Benitz’s pages). (1910 Apr-Jun) Assisted JEBz with purchase of estancia El Bermejo (Campo de Araoz). (1909 Dec) JEBz put on a show at Christmas for employee kids - quite the novelty. (1906 Nov) Maid, nurse? Mentioned. (1906 Oct) Of Bell Ville, bought sheep. Colony of tenant farmers, on land owned by Dr. Thome. (1905 June) Mentioned. See Vicente Soto. (1909 Jul) Mrs. Thome asks JEBz to manage it. (1910 Mar) Wheat harvest sold to Carlemagno. ; Apr'10: Meeting by JEBz, see José Migliori. JEBz daughter - see Benitz, Marjorie D.
(1908 Sep) See His Grace. Benitz family lawyer in Rosario. Mentioned too often re JEBz’s legal & banking matters to list all references. (1907 Jan) Visited, with papers of incorporation (detailed). (1909 Apr) Handles JEBz’s loans - continuous process. (1910 Jan) Visitor Cruz Grande. ; Nov'10: met JEBz on return from England. (1912 Jun) Loans backed by JEBz due. (1906 May) Scouts. Mentioned in lawsuit, Francis vs. Austin. The Cane Sand Dunes, area next to the Rio Saladillo, SE of Wenceslao Escalante town; about 25km south of Los Algarrobos. (1906 Jun) See Luis Medaruiz. (1906 Nov) See Salvador Baurman y Ferndandez. (1911 Jan) See Buatista Mottino. Estanciero at La Victoria, in the Médanos de las Cañas. (1907 Aug) Mayordomo at El Carmen, visited. (1904 Aug.) Carriage factory, mentioned. (1910 Apr) JEBz heeting held at his house. (1907 Oct) JEBz requests boar from US; Polland China, arrived 8 May'08, died 6 Sep'08. (1909 Feb) JEBz requests Poland China boar. Estancia owned by Agar family, immediately to the north of Los Algarrobos between it and the rail-road. Managed under the supervision of JEBz. (1906 Jul) Managed by W.H. Warnock. (1908 Dec 24) W.H. Warnock died. (1909 Feb 11) Harley Storey became manager. (1911 Nov) Rented to AABz, he also bought all the cattle. Of Bell Ville? Secretary of Roads commission - Union. (1911 Nov) JEBz took to Córdoba. Town in the department (county) of Unión, south-east Córdoba province; Los Algarrobos is 20km. to its SW. See maps above and its history below. Estancia, location & ownership unclear. See Señor Lowrie. (1907 Oct) Estancia (owned by the Schiele family?) 10km. south of Bell Ville, mentioned. (1905 Oct) Town 20km. south of Los Algarrobos. (1905 Mar.) Estancia (owned by/with Mr. Cross & John Todd). Managed by Mr. Lambert & Mr. M. Francis under JEBz’s supervision. Sold Oct./Nov. 1905, settled June 1907. (1910 Feb) Mentioned re horses. Sharsted Works. Kensington London S.E. England. (1909 Nov) 15 rams arrived. (1911 Jul) JEBz requested more rams. Coventry House, South Place, Pam? ?ust, London E.C. (1907 May) JEBz requests 2 Hampshire Down rams. Owned camp bordering La California to the north, east of the rail-road (formerly part of Kemmis’ estancia Las Rosas). (1910 Nov) Met JEBz in BA on return from England. (1907 Sep) JEBz visited his estancia, near Cañada de Gómez. (1909 May 12) WOBz travels by motor car from La California to Los Algarrobos, first time. From Medanos de las Cañas. (1904 May) Forman of masons at Los Algarrobos, left. (1911 Jan) Contracted to build almacen (store) & bakery at Woodgate. (1910 Feb) Bought horses from El Victoriano. Prophessor at Illinois Agricultural College, USA. (1910 Feb) JEBz requests Polland China pigs, via WOBz. (1909 Mar) Mentioned re trains. (1909 Dec) Became head book-keeper at Los Algarrobos, $200/mo. (1910 Mar) Visited with Dr. Hanley. Estanciero & celebrated polo player. (1911 Jul) JEBz sent him umbrella paraiso (chinaberry) trees. Señador for Cba. Comisión de Caminos. (1910 Apr) JEBz met searching for camp in the Chaco. (1905 June) Tenant, contracted to rent. (1905 July) Estanciero, San Bernardo, near Dennhy, prov. BA. See: Show and Exposición Rural in our Spanglish Glossary of camp terminology. Estancia rented by the Benitz brothers and managed by AABz from 1890 to 1907+. Located west of the town of Calchaquí, between the Calchaquí and Salado rivers in north Santa Fé province. Semi-forested it was used for cattle breeding (8,000+ head). See Alfred’s day-books for the years 1884-1904 when he ran cattle at Laguna Yacaré and Los Palmares. Port on the Rio Paraguay, 60km. north of Resistencia (Chaco province). Starting point for JEBz's trips to Ea. El Bermejo. (1910 Apr) Mentioned re El Bermejo. 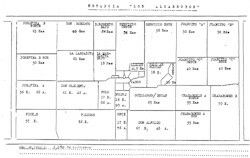 (1909 Dec) (1910 Jan) Met re land titles, land sold to AABz & JEBz. (1910 Jun) Commission agents mentioned re potros at San Sebastian. (1907 Aug) Closed a road, JEBz tried to reopen. Pupil (apprentice / segundo) at Los Algarrobos; in May'13, he married JEBz’s niece: Nena Benitz, daughter of WOBz. (1904 July) Arrived from England. (1906 Nov) Mentioned, trip to UK. (1908 Nov) Returned from Chaco with brother(?). (1910 Nov) Recommended Sixto Yrrazabal to manage El Bermejo. In Chaco. Did JEBz mean E. Graham Paul? (1909 Nov) JEBz sends him gift of 2 stallions. (1909 Nov) Left Los Algarrobos to join brother (Paul?) in the Chaco (most likely north SFé). (1908 Dec) Visiting nephews, from England. 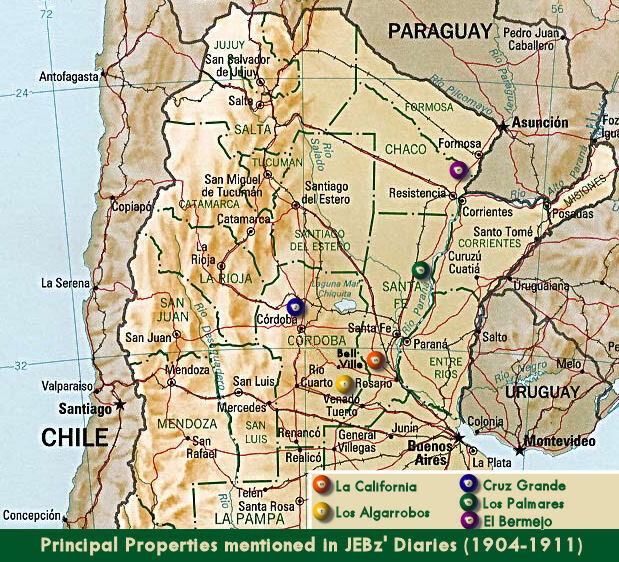 (1910 Apr) Revised camps with JEBz during purchase of estancia El Bermejo (Campo de Araoz). (1911 Jun) Mentioned re Zapata land exchange. (1907 Sep) JEBz visited, in Cañada de Gómez. (1909 Nov.) Mentioned re horse & “young Holland”. JEBz played often at La California, he makes little mention of it at Los Algarrobos. (1907 May) Orders stallion from England - see J.G. Stratter. (1909 Oct) Marks polo grounds, Oct. 1; holds first tournament, Oct. 26. (1911 Aug) Tournament at Los Algarrobos. (1910 Jun) As capataz, sent to fetch potros at estancia San Sebastian. (1905 Oct) JEBz attended remate. A person from the port, i.e. Buenos Aires. Term applied to anyone from Buenos Aires and its suburbs. Like their counterparts from New York and Paris, they are often regarded as arrogant by their unfortunate countrymen. (1910 Mar) JEBz recommended him for a loan so he could buy land. Departmento de… The department (county) in which La Cumbre and other resort villages are located, central Córdoba province NW of Córdoba city. See The Hills. (End of the rail line) There are several such towns. JEBz (1911) - end of the RR line 47 km. west of Las Palmas (Chaco prov. ), port on the Paraguay river. About half way between the river and estancia El Bermejo. Name by which JEBz refers to AABz’s property that became El Rincón. It encompassed the entire watershed of the valley (quebrada) above JEBz’s own property on the Cruz Grande river. (1908 Jul) JEBz bought it for AABz from Belisario Cabanillas & Ezequiel Casares acting for Mercedes Zapata de Gómez, $2,702 on 20 Jul'08. Estancia NW of Las Rosas (SFé), see La California for more details. (1909 Nov) JEBz made him a present of a horse via the Paul bros.
(1910 Apr) JEBz visits in Reconquista. Founded as a fort in 1871, it is a coastal town on the Paraná river 490km. north of Rosario (or 325km. north of Santa Fé city). It lies within the Chaco climate/geographic region. (1906 Aug) Short-horn judge (Sociedad Rural Santafecina, Rosario) with JEBz. (1909 Sep) judges cattle in Bell Ville. Capital and largest city of the Chaco national territory (became a province in 1951). It is on the Paraná river just below where the Paraná is joined by the Paraguay river. Term of respect for Richard Agar. (1904 Sept.) Mentioned, w/Don Ricardo. AABz’s summer home in Cruz Grande, Córdoba. Encompasses the the Cruz Grande river valley (quebrada) above the summer homes of his mother and siblings. Built in 1915, it is still in the family (2010). See La Quebrada & The Hills. (1908 Jul) Purchased, see La Quebrada. Important town 220km. south of Córdoba city and 150km. west of Los Algarrobos. River Plate Fresh Meat Co.
JEBz also calls it: “Frigorifico River Plate”, its name more likely: “Frigorifico Rio de la Plata”. (1909 Dec), (1910 Jan) JEBz sold steers to them, see Mr. Mac.Cormick. (1907 Mar) See Josephine Bz de Schreiber. (1909 Dec) Met re land titles, land sold to AABz & JEBz by Pantaleon & Medardo Heredia. (1908 Nov) tin smith, re gas & water at La Minnesota. (1909 Nov) Re gas lines at La Josefina. Large commercial / business city north of Buenos Aires on the Paraná River, in the province of Santa Fé. For a long time it was the second largest city in Argentina. It is also an important grain exporting port. The Sociedad Rural Santafecina put on the shows in Rosario. Estancia imediately east of the town of Las Rosas established in 1864 by William Kemmis. Town in the department (county) of Belgrano, central Santa Fe province, about 40 km. north of Cañada de Gómez, founded in 1889 by William Kemmis and made the county seat in 1890. See also Las Lomas. Las Tres Lagunas borders it to the south-west; La California is 9 km. to its south-east. Partner in The Bermejo Estancia Co. Ltd.
(1910 May) Mentioned during purchase. Escribano at Banco Hipotecario Nacional. (1910 May) Met re purchase of El Bermejo. Estancia north of Las Rosas (SFé), see La California for more details. Estancia near Dennhy, prov. BA, owned by Juan Ortiz de Rosas. (1905 July) JEBz bought stallion. Town 20 km. east of Bell Ville & 30km. north of Monte Buey (on RR between Rosario & Córdoba city, see map). Estancia, possibly near Ascochinga (Cba). (1911 May) Mentioned, see Mr Cox. (1907 Aug) Myth that there is always a rain storm within 5 days of Santa Rosa, August 30th. Italian doctor in Monte Maíz. (1904 May) Estanciero, sold to JEBz ¼ league (La Escondida) next to El Victoriano. (1907 Aug.) JEBz met with, manager Banco Britanico in BA. In 1874, the Schiele family (from Germany) arrived in Argentina with the Benitz and Bohtlingk families, on the ship S.S. Boyne. The Schiele family settled 60km. west of Venado Tuerto (SFé) in Córdoba prov., on estancia Las Tunas. (1907 Oct) Visited. See: Schiele (family). JEBz’s niece, daughter of Josephine Bz de Schreiber. (1908 Apr) Marjorie attended her wedding. Either Josephine Bz (JEBz’s sister) or John Schreiber, her husband. (1907 Mar) JEBz sold them land he bought from Zapata; became the Schreiber’s Los Nogales, between JEBz’s Cruz Grande & the narrow lane to AABz’s El Rincon. (1908 Apr) JEBz took back “a bit” of the land. Investment company JEBz established with Mr. T. Agar, major investor & president. The company owned El Victoriano and La Escondida which were managed by JEBz. (1904 March) First mentioned when JEBz received 15 shares dated July 7, 1903. See also El Bermejo. (1905 Nov) Operated on JEBz’s nose. (1907 May) Estanciero, see El Venado. (1906 Jun) In England, comissioned to buy a stallion. A chain of mountains (highest: Uritorco – 1,950 mts.) running north-south immediately to the west of Córdoba city. A series of summer resort villages are found on its western slopes where the climate is very pleasant in summer; the air is cool, dry, and fresh. Anglo-Argentines favored the area close to La Cumbre, about 90 km. drive north-west of Córdoba city - see The Hills. A north-south chain of higher mountains (highest: Champaquí – 2,790 mts.) paralleling and west of the Sierras Chicas. On its western slopes, just south of Cura Brochero, are the villages of Mina Clavero and Nono where the more reclusive Anglo-Argentines preferred to retire. The climate is drier, the amenities more austere. (1910 Apr) Presented by Dr Vadilla. Offered JEBz camps on Bermejo river (Chaco province). See estancia El Bermejo (Campo de Araoz). Named swapped around. See Los Algarrobos Sociedad Anónima Ganadera. (1908 Jun) Created, JEBz founding board member, became Sociedad Rural Union. (1911 Aug) JEBz judges cattle. Also see Sociedad Rural de Bell Ville. Put on cattle shows (exposición rural). (1908 Sep) First show - JEBz donated prize winnings to hospital. (1909 Sep) JEBz judges cattle. (1910 Apr) Paid long standing debt. (1905 Apr) Contracted to buy horses. In May'05, supervised alfa sowing at Colonia Margarita. (1906 Nov) Contracted to buy horses. Distinguised English public school, in Quilmes - a suburb south of BA. (1911 May) Little John & Alfred enrolled, $854/term. (1909 Nov) JEBz bought bulls from him. (1908 Apr & Oct) JEBz backed notes. (1909 Feb 11) Arrived at La Minnesota with family (Agnes & 3 boys). Assumed its management. (1910 Dec) To Cruz Grande for New Year. (1911 Oct) Mentioned de loan. Family friends of the Benitz, living in Villa Constitución. Of: Bron Edge Lodge, Buxton, Derbyshire, England. (1907 May) JEBz contracted him to obtain a polo pony stallion (see Sep'07). Began as a segundo, in 1917 married Elsie while in England during WW-I. Their share of Los Algarrobos they named El Venado. b. 1889 Lincoln, England; m. 1917 London; d. 1966 Ea. “Chacabuco”, Neuquen. See Elsie Benitz for more. (1910 Oct) Joined JEBz family on return from England, to be a segundo at Los Algarrobos. Anglo Normandy stallion from France, see Harold Sessions. (1906 Oct) Arrived. (1907 Jun), (1908 May) Mentioned. (1911 Jun) Mentioned re Juan (Mottino?). (1908 May) Mentioned re Sec. Beyados. (1911 May) JEBz obtains permission to connect Los Algarrrobos, La Minnesota, and El Victoriano to Woodgate. Dr. Thome, an astronomer from Pennsylvania, was (as of 1885) the director of the Argentine National Observatory in Córdoba. (1907 Jan) Called upon in Córdoba city. See La Margarita. (1908 May) Mentioned, died 28 Sep'08. Mrs. Thome (formerly Frances Wall) was one of the U.S. school-teachers brought to Argentina by President Sarmiento; see “65 Valiants”, by Alice Houston Luiggi, p. 161-164. (1909 Jul) Requests JEBz to manage La Margarita. Dr. Thome’s daughter. See also: Hill, Mr. & Mrs.
Thompson, Enrique A. / Henry A. (1907 Sep) Bought old ewes. 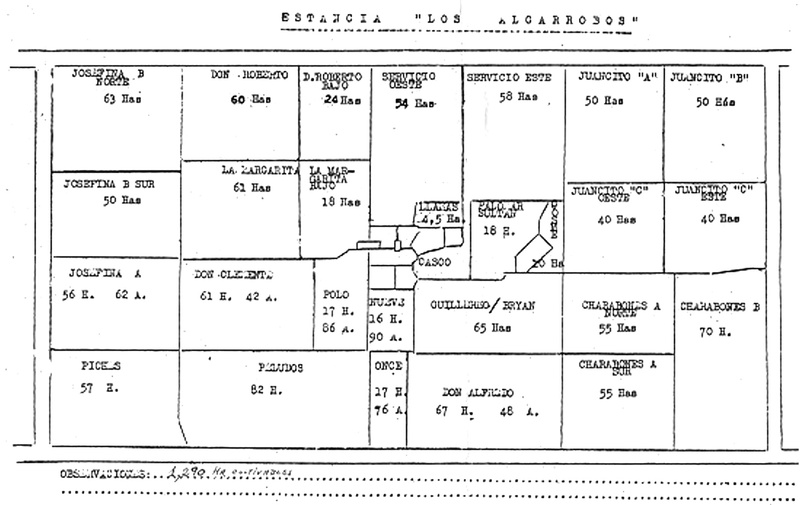 Estancia owned by AABz, part of the original La California. Allotted to Alfred in 1898 when the Benitz brothers split up the properties they held in common. Most of it, including its casco, was allotted to Willie Horner after Olga’s death in 1963. Willie died in 1994 and it was split between his children. Part of it has since been sold. See Las Tres Lagunas. Abbreviation used within the Benitz family for estancia Las Tres Lagunas. AABz’s friend & hunting companion. (1905 May) Mentioned re Monterey. a.k.a. The TL. Estancia (½ league) bought by AABz in 1908, it became his principal home. The town of Las Rosas borders it to the north, estancia Las Tijeras borders it to the south. After Olga died in 1963, it and Las Tijeras were split between John, Mary, & Willie Horner into: TL, Don Alfredo, and Las Tijeras respectively. Don Alfredo	was created from western sections of the original two estancias. During the 1990’s half the remainder of the TL was sold, the closest part to Las Rosas including the casco. (1909 Jun) JEBz attended remate. (1909 Nov) JEBz helps AABz buy the TL. Estancia belonging to the Schiele family, 60km. south of Los Algarrobos, 60km. west of Venado Tuerto (SFé). (1908 Sep) With own crew, planting trees. Employee? Departmento de… The department (county) in which Monte Buey and Los Algarrobos are located, located in south-eastern Córdoba province. (1907 Aug) Land agent. JEBz offered him $65/ha. for 2,114 has. adjoining Los Algarrobos to the south, owned by Gibson Hnos. Offered on $60/ha., 20 Dec'07. (see blue map). (1908 Jan-Mar) Deal failed, 26 Mar'08, alive again 24 Jun'08. (1910 Apr) Area of El Bermejo checked by JEBz. Estancia near Diaz (SFé), owned by Sanalguie. (1905 May) Visited by JEBz. Estancia near Gral. Belgrano (100km. south of BA), owned by Felipe Semillosa. (1907 May) JEBz attended its sale. Estancia, southern part of Los Algarrobos. JEBz’s daughter Elsie and her husband Tommy Sympson inherited it when the Algarrobos was split up, c.1930. They sold it c.1960 when they retired to Nono, in the Sierras Grandes (Cba). Important town in the southern tip of the Santa Fé province. Town 70km. SW from Reconquista (SFé). Estancia in the Méndanos de las Cañas, owned by Luis Medaruiz. (1906 Jun) JEBz put cattlet there. Estancia north of Los Algarrobos, owned by the Scottish Estancia Co. Ltd; in which JEBz held shares. First mention: Apr'04. (1904 May) ¼ league added, bought from Benjamín Sastre at $40/ha., see La Escondida for details. (1908 Apr) See F.C.C.O. ; 3 May'08 received notice it is to be sold(?). (1911 May) Severe drought is endangering the cattle. Jul'11: Recuento. Dec'11: Wells bored. Port town on the Rio Paraná south of Rosario, in Santa Fé. Owner of estancia El Dorado, near Vedia (BA prov.). (1909 Dec) Arrived from Ireland to settle his brother’s affairs. (1908 Oct) Selected bulls bought from M. Cobo. (1908 Dec 24) Died in Bell Ville. (1908 Dec) See Miss Flattoe. Per context, see (JEBz) John’s brother: Benitz, William O. (WOBz, died 1910), or nephew: Benitz, William A. (WABz). (1904 Mar) Mentioned, book-keeper (at Los Algarrobos). (1907 Jun) Mentioned re Mr Cross & Monterey. Early name for Monte Buey - see its history at foot of page. (1911 Jan) Name first mentioned. Nov'11 JEBz buys a lot. (1910 Nov) Recommended by Mr. Paul as manager for El Bermejo. (1911 Jun) JEBz traded land with her in Cruz Grande. (1905 Oct) Sold land to JEBz, in the Cruz Grande valley. (1907 Mar) Mentioned, see J. Schreiber. (1911 May) Died; June'11: JEBz bought land from heirs, then traded it with Antonia Zapata. (1908 Apr) Mentioned with Mauricio Zapata re land sold to AABz. (1908 Jul) Sold La Quebrada to JEBz (acting for AABz, became El Rincón). (1910 Feb) Sent to La Cumbre with horses for Mr Garrett. In 1909, when the F.C.C.A. began laying the railroad line from Cruz Alta to Córdoba, today’s district of Monte Buey [Ox Woods] belonged politically and administratively to Saladillo, at that time the only sign of civilization in the region, apart from some scattered estancias [ranches]. 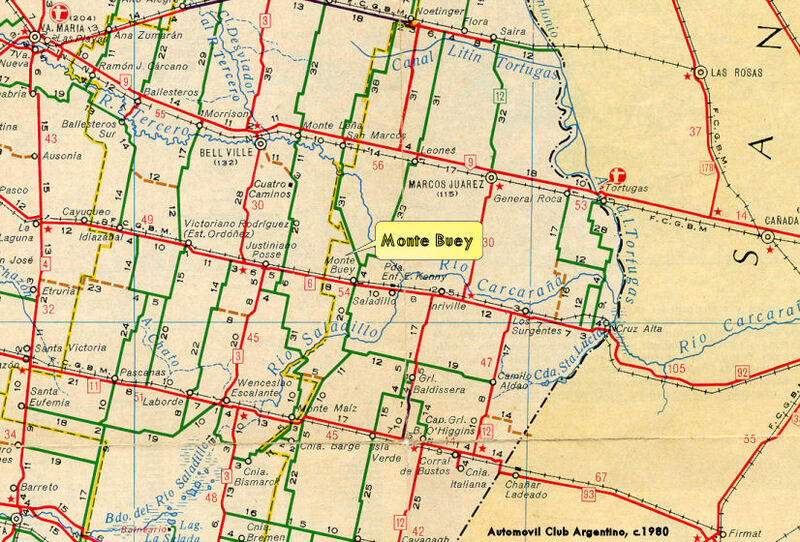 In those days, the future urban area of Monte Buey belonged to estancia “Monte del Buey”, the property of the spouses don Federico Judson and doña Luisa Carpenter de Judson [Mr. Frederick E. Judson and Mrs. Luisa Judson (née Carpenter)], who donated it to the railroad in 1909 with the explicit condition that the town would take the name of the estancia. However, the original name was Woodgate by which the town was known until 1916. When the Cruz Alta to Córdoba line was put into public service on the 22nd of October, 1910, the railroad station was the sole building in existance. Towards the end of the 19th century, the neighbouring lands of Monte Buey began to be sold for the purpose of establishing agricultural enterprises known as estancias [ranches]. Most of those who settled the area and established what are today the historic estancia cascos [ranch headquarters] were of English origin. Amongst many others, we can list “Los Algarrobos”, “La Maya”, “La Minesota”, “El Victoriano”, “Santo Domingo”, “San Ponciano”, etc. Monte Buey’s first residents established themselves after 1910, don [Mr.] Enrique Chem, the brothers Gudiño, Pascual Ceballos and others. Faced with the advent of numerous colonies and residents, it was necessary to set up a local government. The first municipal commission was created in 1915, presided over by don Juan Benitz [Mr. John Benitz]. 11 June - Montevideo — Maclean delivered map of El Bermejo. 2 July - London — Arrived at Hotel Victoria (today part of MoD offices). 5 July - Peterborough — JEBz attended livestock show. 7 July - London — JEBz met with T. Agar, M. Cross, Col. Ruston re El Bermejo. Formed company: The Bermejo Estancia Co. Ltd.
12 July - To France — Travelling with Marjorie, AABz, Mr. Mews (agent for H. Soniose). 14 July - Nogent-le-Routrou (150km SW of Paris) — JEBz & AABz bought Percheron stallions. 15 July - Caen — Bought Anglo Normandy stallions, from Alfred Gallier. 17 July - Paris & London — Stayed at Hotel Victoria. 19 July - York & Peterborough — Motored about, searching for stallions & boars. 20 July - Cambridge & Waldon — Bought Hackney & Shire stallions. 21 July - London — Lunched with nephew Frank A. Benitz (WOBz’s second son). 26 July - St.Andrew’s (Scotland) — Joined Marjorie, Mrs. Bischoff, Miss Dawney at Renack hotel, met daughters. 28 July - To Lockearnhead — Entire family group. 4 Aug - To Dumfries via Glasgow — Staying with Turners. Bought clock for JKBz. 8 Aug - To London — Staying at Hotel Victoria. 10 Aug - Coventry — Bought Daimler car, 2 seater. 12 Aug - New Quay (Cornwall) — Joined Agar family at Headlands Hotel. 18 Aug - Clovelly (Devon) — Visited Birmingham family. 22 Aug - Dublin (Ireland) — Stayed at Shelbourne Hotel manager’s home. Attended horse show. 30 Aug - London — Hotel Victoria. 20 Sep - Tring Park — Bought Shire stallion from Lord Rothchild. 21 Sep - St.Andrew’s — Took daughters back to school. 28 Sep - London — Meeting of the The Bermejo Estancia Co.Ltd. - partners listed, see diary. 6 Oct - London — Board meeting of The Bermejo Estancia Co.Ltd. - detailed, see diary. 12 Oct - London — JEBz received several powers of attorney for Co.
13 Oct - To Southampton — Motored down with Mr. & Mrs. Agar. 14 Oct - Southampton — Sailed for BA on R.M.S.P. Amazon. Accompanied by Miss S. Court (new governess), Kenneth Avery (nephew of Mrs. Agar), Thomas Sympson (segundo at Los Algarrobos, would marry Elsie 1917). 5 Nov - Buenos Aires — Met by F.C. Marty & Victor Morando.